← How do you love your lentils? I just cannot get enough of juicy, ripe local strawberries. While we are now fortunate to be able to enjoy them all summer long thanks to everbearing plants, there is something irresistible about the first crop in June. I’ve been making all my berry-licious favorites, from scones to ice cream to wickedly wonderful grilled strawberry daiquiris. Last night, my tastebuds were leaning towards something savoury, which is how this dish came to be. I made a not-too-spicy, not-too-tart salsa which would be a very family-friendly version; you can easily torque up the heat and tang if that’s your preference. I’m often asked how to grill bone-in chicken so it cooks thoroughly yet doesn’t dry out; you’ll see my technique in the method below. If you’re like me and swoon over all things strawberry, you might be happy to know that the salsa is also delicious on toast or as a dipper for pita or tortilla chips. 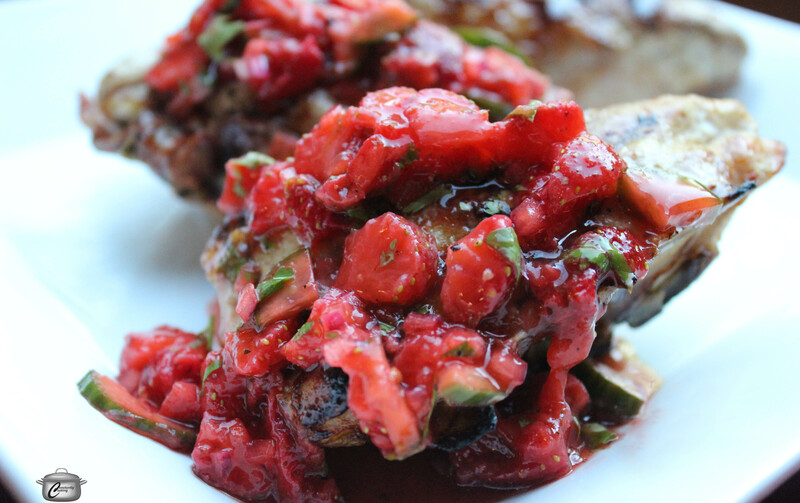 Salsa made with ripe strawberries, cilantro, cucumber and red onion is the perfect pairing with grilled chicken. Combine strawberries, onion, cucumbers and cilantro in a bowl. Add lime zest and juice, salt and pepper, maple syrup and hot sauce. Stir to blend well. Taste and adjust seasonings to your preference. Cover and let sit for 1 – 3 hours; refrigerate for longer storage. When ready to cook chicken, preheat grill to medium-high (400F). Drizzle skin side of chicken breasts with a little olive oil. Place a sheet of heavy duty foil just big enough to hold chicken pieces in one layer on the hot grill, then lay chicken pieces on top, skin side up. Close the barbeque lid and cook for approximately 20 – 25 minutes, or until chicken is about 120F (measure the thickest part of the largest piece with an instant-read thermometer). Flip the chicken so it’s now skin side down on the foil and cook for about another 10 minutes. When chicken is at 155F, flip it again and brush the tops (skin side) with balsamic vinegar. Place the chicken breasts skin side down directly on the grill (moving the foil aside if needed). Cook for about 5 minutes, until chicken reaches a temperature of 165F. Remove chicken from heat, arrange on a platter and spoon salsa over top. Serve immediately. This entry was posted in Grilling, Meat, poultry, summer and tagged balsamic, barbequed, chicken, cilantro, cucumber, grilled, hot sauce, lime, maple syrup, olive oil, red onion, salsa, solstice, strawberries, strawberry, summer. Bookmark the permalink.